We are engaged in this business since 1996 and we export all kinds of New & Reusable Marine Safety Equipments from India. We also make local supply and supply to vessels arriving at major Ports on East & West Coast of India, according to the requirements received by us. We are well established as one of the prime supplier of Marine Electronics, Navigational, Safety Equipments & Ship spare-parts and accessories to a large number of renowned stockiest, re-conditioners, ship managers and traders throughout the world. 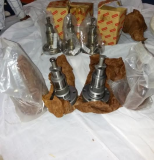 DAIHATSU - YANMAR - SULZER - MAK - CATERPILLAR - HITACHI - B&W - ALCO - DEUTZ - PIELSTICK PIELSTICK - WARTSILLA - MITSUBISHI - MWM - MTU - SPERRE - TANABE - HATALAPA - BBC/ IHI TURBOCHARGERS - SPARE - PARTS OF ALFA LAVAL / MITSUBISHI PURIFIERS.